I live in a really white world and I don’t mean the population, I mean my environment. My office, my home, most of my favorite shirts, my towels, sheets & linens, to name a few-are all white and it makes me feel good. So, when I inject a dose of color. Pow…it is really luscious. 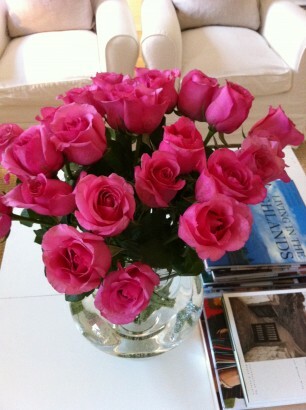 Recently, one of my dearest friends brought me this bouquet of gorgeous roses. I put the vase in the sitting room which is white, of course, and the room was transformed as was I every time I looked at that delicious color. It was a lovely gift from a lovely friend and made each day that I enjoyed those flowers more lovely too.